Car insurance rates vary greatly from one driver to another. There is a huge number of factors that affect the estimates you get from insurers. One significant factor is of course you car. 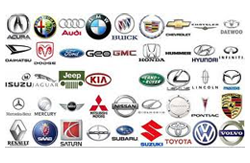 Make, model, trim level and even year of your vehicle has influence on your premium. This is why we have complied a database of nationwide average premiums for most vehicle sold currently in the USA. Keep in mind that these are just average premiums and your premium will be different. Also do not forget that when shopping for car insurance quotes for any car, comparison is the best way to minimize your insurance expenses. So go ahead and select the car make that you are interested in and then select the model.